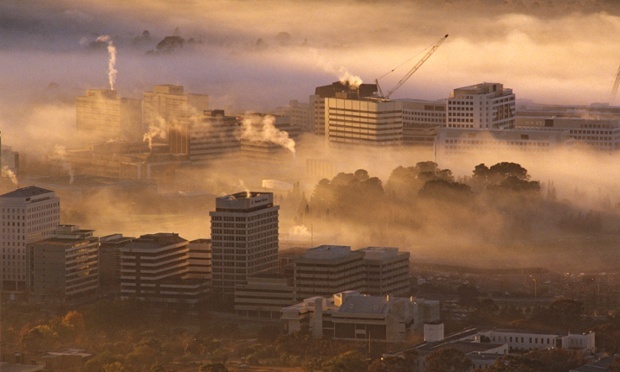 50 years of gentrification: will all our cities turn into ‘deathly’ Canberra? What makes a liveable city? Having lots of nice parks, you might think, a decent public transport system, good schools and hospitals, great architecture, exciting nightlife, easy access to the countryside. These are just some of the factors used by organisations who draw up annual lists of “the most liveable cities in the world”. And yet somehow, they end up with Canberra. This year, for the second year running, Australia’s political capital was named the best city in the world by the OECD (Organisation for Economic Co-operation and Development), a result that made northern hemisphere observers wonder if, down under, they were looking at the rankings upside down. Canberra is a deathly place. It is a city conceived as a monument to the roundabout and the retail park, a bleak and relentless landscape of axial boulevards and manicured verges, dotted with puffed-up state buildings and gigantic shopping sheds. It is what a city looks like when it is left to politicians to plan. So what other cities make it on to the rankings? The Economist Intelligence Unit puts Melbourne in first place, followed by Vienna, Vancouver, Toronto, Adelaide and Calgary. There is never any mention, on any list, of London or New York, Paris or Hong Kong. There are no liveable cities where you might actually want to live. It makes you wonder if their chief parameter is finding a place where you won’t be disturbed from reading the Economist on a windswept plaza, surrounded by the soulless wipe-clean charm of an identikit downtown. Liveability, it seems, is defined by a total absence of risk or chance, pleasure or surprise. It is an index of comfort, a guide to places where you can go safe in the knowledge you’ll never be far from a Starbucks. The one thing many of these cities have in common is that they are places where Jan Gehl has worked his magic. 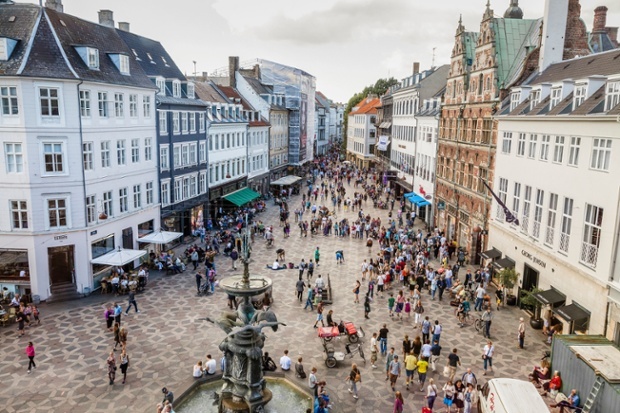 The Danish guru of streets and public spaces has made a career out of travelling the world to whisper sweet nothings about pedestrianisation and pavement cafes into the ears of enrapt mayors. He has become the patron saint of liveability. This week he met up with his old chum Richard Rogers, our own doyen of the public realm, along with Arup’s head of planning, Jerome Frost, to discuss what makes a liveable city, at a Guardian Live event that I had the pleasure of chairing. At 78 and 81 respectively, Gehl and Rogers are titans of talking about how places can be made better, having advised most global cities between them. They dutifully conversed about the primacy of the bicycle, how cities should be for people not cars, the importance of density and sustainability. Copenhagen was held up as the ultimate model, a city that has been turned into a utopia for people and bikes over the last 50 years, in no small part due to Gehl’s pioneering work. He pointed out that it consistently tops Monocle magazine’s liveability list. His granddaughter can now walk all the way to school without having to cross a road. Copenhagen … Denmark’s utopia for people and bikes. Photograph: Alamy Rogers recounted the principles he set out in his landmark white paper, Towards an Urban Renaissance, published in 1999 as the product of the Urban Task Force he chaired under New Labour, which has guided urban regeneration in the UK ever since. Build on brownfield land and build tall, he said; lure people back into city centres with cultural buildings, flats and better public spaces; invest in public transport and build over transport nodes. Their values are difficult to argue with: it’s all people-centred common sense, with a good dose of al fresco dolce vita. Everything would be fine if everywhere was a bit more like Siena. “They said pedestrianisation would never work in Copenhagen because we’re Danes not Italians,” said Gehl. “But now we’re more Italian than the Italians.” A contented smile crossed his face. Yet the nature of what has happened in numerous cities, since both men set out their visionary stall 20 years ago or more, is often a very different animal to what was espoused in their manifestos. In their influential, highly seductive texts, there is rarely any mention of questions of power and conflict, nor who or what will be driving the development. There is no acknowledgement that their new city visions might come at the cost of something else. Take the holy grail of public space, held up by both Rogers and Gehl as the ultimate good: plazas and piazzas in concrete and granite are conflated with the abstract idea of the civic commons. “It’s good for democracy if people can meet each other on the street,” said Gehl. 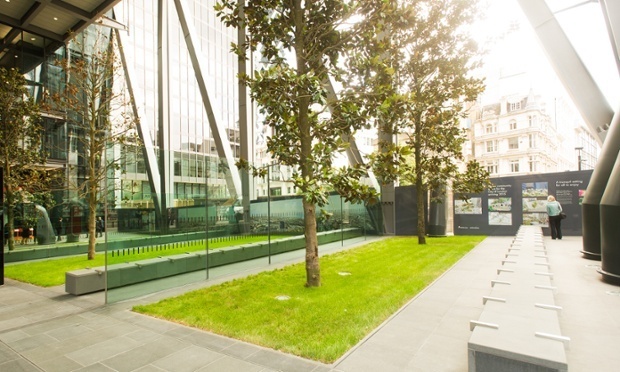 The ‘public space’ beneath the Cheesegrater is managed by Broadgate Estates, the company that evicted protesters from Paternoster Square. Photograph: Sonja Horsman/Observer I put this to Rogers. Might the future of Cheesegrater Square be a place where personal provisions of parmesan may not be consumed? It is the same response he gives when challenged about all the other buildings his office has produced in London over the last few years. One Hyde Park, Neo-Bankside, Riverlight: three of the most exclusive developments of luxury apartments the city has ever seen, most of which stand empty as vacant silos for foreign investors, safe deposit boxes stacked up in the sky. In 1997, Rogers railed against the creeping influence of the paranoid gated communities he had seen in LA, which were “segregating rich from poor and stripping citizenship of its very meaning”. “A new type of citadel has emerged,” he wrote in Cities for a Small Planet. “At the touch of a button, access is blocked, bullet-proof screens are activated, bomb-proof shutters roll down. The appearance of the ‘wrong sort of person’ triggers quiet panic.” Fifteen years on, this could be straight from the sales brochure of any one of his new developments. “You can’t stop private buildings having surveillance,” he responded. But with a practice of 200 working across the globe, you don’t have to accept every commission. And as a member of the House of Lords, these are issues one might have a position to lobby for. 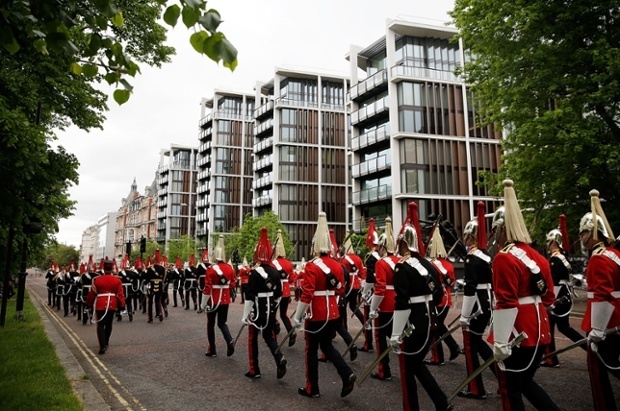 Exclusive … the Household Cavalry march past One Hyde Park luxury apartments in London. Photograph: Matthew Lloyd/Getty Images Another question of the evening was how to deliver urban regeneration without encouraging excessive gentrification. Asking architects about gentrification – particularly one whose practice is defined as urban quality consultants – is a bit like asking sweet manufacturers how to reduce the problem of obesity. They are, of course, agents of gentrification, purveyors of the urban lubricant that smooths the displacement of those on lower incomes to make way for the arrival of more wealthy residents. They are hired by public authorities and private developers to conjure “value uplift”. It is neither a new nor unusual phenomenon, but this year it proves to be particularly timely: the term gentrification was coined exactly 50 years ago, in the prescient writings of Marxist sociologist Ruth Glass. “London may acquire a rare complaint,” she wrote in 1964, after studying the rapid change of places like Notting Hill and Islington, from neighbourhoods of blue-collar workers to desirable havens for the middle-class urban gentry. “[The city] may soon be faced with an embarras de richesses in her central area – and this will prove to be a problem.” The idea of the inner-city becoming desirable and overpriced was unthinkable at the time. But 50 years on, we have exceeded her worst nightmares. A recent report concluded that Islington has been subject to a wave of “supergentrification”, after an influx of London’s financial elite, meaning that middle-class professional families can no longer afford to put down roots. By the end of the decade, those who do not qualify for social housing will need to earn £90,000 a year just to rent in the area, it claimed. “This will leave Islington polarised, with very wealthy families at the top, a youthful transient and childless sector in the middle, and those on low incomes at the bottom, living in social housing.” But with better paving, nicer parks and a branch of every chain restaurant along the high street – along with private security, courtesy of the local business improvement district – it will no doubt be more liveable. One step closer to the dream of Canberra.